I’m glad so many of you liked the pics of Pop hugging me. Pop and I share many things and one is our love of the color blue. It made sense that for Pop’s birthday a few years back, I bought him a cotton/bamboo blanket in sky blue. For the sake of the Saturday PhotoHunt, we’ll call it azure since that’s this week’s theme. I look stunning in blue and I’m sure that’s why my intake photos at Companion Animal Placement were against a blue an azure backdrop. This blanket is so soft. 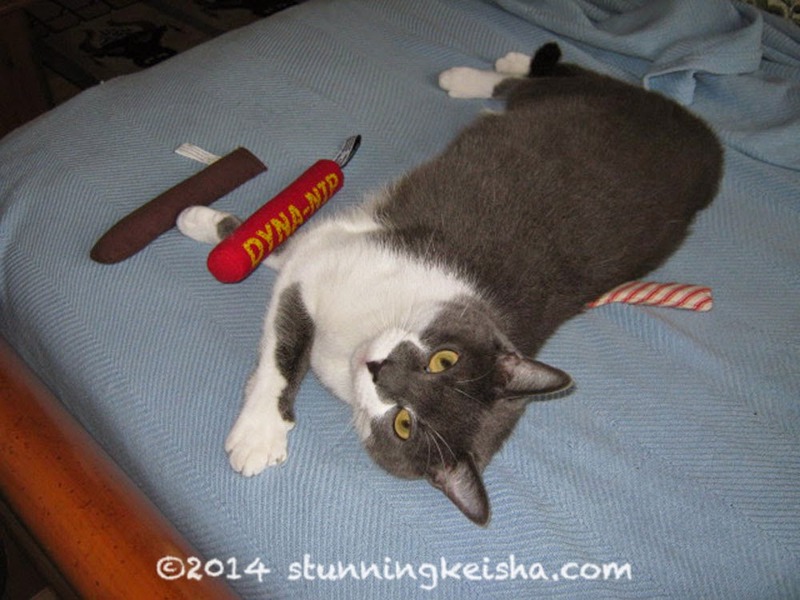 I love to lay on it—and play on it— and over the years, it’s gotten a few pulls and snags from wayward claws. Here I’ve got three of my nip toys. For Athena & Marie’s Caturday Art Blog Hop, I’ve taken another photo from the same series to show you how a photo fail can be salvaged. I thank Athena and Marie for giving me the chance to rescue these otherwise unusable pics. I present to you Keisha_1857, completely untouched. I didn’t even watermark it cos who’d want to steal it? As per usual when TW is the photographer, it’s out of focus. Again, she’ll claim I was moving my head or she was using some fancy gel. Total bullcarp. I’d advise professional photographers like Glogirly and Sparkle’s human to cover their eyes or they might faint at TW’s incontinence at photo taking. Here’s the same photo using two different filters. The first is the Image Tile filter from PhotoShop and the second is playing around with an online program’s pop art filter. AbraCATdabra! Would you ever guess what a throwaway the original photo was? The motto is: don’t discard a photo without realizing its true value. Andy Warhol wishes he'd had a model as stunning as myself to work with. Love your special blankie and your artwork. It's fun to salvage photos! Oh, we DO like YOU on BLUE! You do look great on blue! The fun thing (to my human) with the different oil painting effects and apps that she has is that she can use them on photos that are out of focus and make them work! I know, I know - now all the paparazzi are going to shoot photos indiscriminately and we'll get even less peace! Pawsome artwork by mum CK. You'll be giving my peeps ideas. Have a super Saturday. The art images are beautiful. Love the pop art effect! Blue IS so YOU dahling!! Well CK I agree......that BLUE is definitely YOU. But then again when you're stunning (as you are) it's tough NOT to look purrrfect on any color! Special blankets are the best! I like the Tile filter on your photo "fail"
I hate to tell you this CK, but M doesn't think that photo is out of focus. Yikes - that must mean that all of mine are because she think's that's normal. Love your art work. We really like the tile effect on your picture. And yup, blue is definitely your color! Very cool! You know, I never really think of stuff like that when I have a photo fail. They sort of get pushed to the back burner. Thanks for your tips! 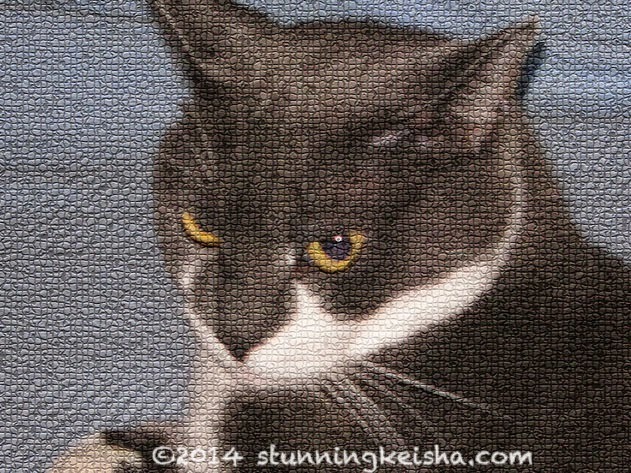 Keisha, you are even more stunning when photographed like this. Very unusual pop art effect. CK, you're always a work of art. The Caturday Art is a great way to salvage photos that didn't quite make the cut. Blue is good color doesn't matter the shade. The blue/azure blankie definitely works and really complements you. And well done with the pic salvage. I'm definitely in TW's class regarding my pics but this is something I'm going to bear in mind to try. Thanks too for coming by and saying hello. I've been reading and occasionally commenting on my good days. I'm enjoying being back blogging as I do love it and catching up with all my favourites as you really do feel like friends I've known for ages. Very cool! We love that colorful Andy Warhol-ish picture of you, CK! You do look good on blue CK. The tile filter gives a great effect. 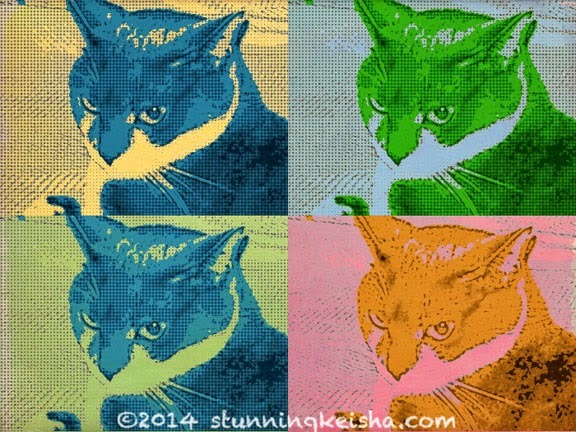 Ooo I like that pop art photo! Oh sweet girl, you looks stunning against ANYTHING! And I love you with that stick of dynamite and the cigar and wait a minnit...did you swipe my candy stick? That is some mighty fancy art CK and you always look might fine! CK, you look adorbs on your Pop's blue blanket, what a sweet photo of you! We really like that pop art effect, very cool! Love what you did with the photo, and you're right - you do look great with blue! Andy Warhol would be eating his heart out. These rival his Marilyn Monroe series! That Warhol effect is so cool. You are stunning in any color. We got a good laugh out of the "photographic INCONTINENCE" line. MOL. XO, Lily Olivia, Mauricio, Misty May, Giulietta, Fiona, Astrid, Lisbeth and Calista Jo.